Today’s summary of a classical and significant paper highlights an important event in radio astronomy. This event results in two astronomers receiving the Nobel Prize while creating some much deserved controversy. It primarily involves three astronomers, Antony Hewish, Jocelyn Bell, and Martin Ryle. Both Hewish and Ryle were the eventual awardees of the 1974 Nobel Prize in Physics for the combined discovery of the first pulsar and development of aperture synthesis for radio telescopes which is described below. 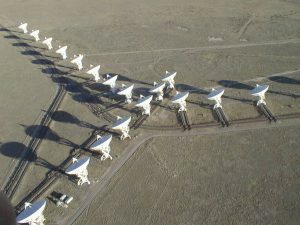 Figure 1: One of the more famous interferometers that use aperture synthesis, the Karl Jansky Very Large Array (VLA). The configuration of each dish in relation to the others allow for many samplings at different scales of the radio sky thus resulting in some amazing images. This discovery isn’t technically the beginning of radio interferometry but it is a significant milestone. Astronomer Martin Ryle had been working on an important technique still used today in radio interferometers known as aperture synthesis. Now why exactly is aperture synthesis so important? Well it allows you to combine the radio emissions captured by 2 or more telescopes and turn it into one large telescope (See Fig. 1). This means that your normal angular resolution which is limited by the size of your telescope, is now limited by the distance between your two (or more) telescopes. Thus you can now achieve exceptionally small angular scales that would not be feasible with a single dish telescope. This clearly becomes important when trying to measure and detect astronomical radio sources that have important features on small scales. One particularly interesting use of this technique in modern day astronomy is shown in the Event Horizon Telescope (EHT), which will use a network of radio telescopes all across the globe to measure the event horizon of the supermassive blackhole (Sagittarius A*) at the center of our galaxy. 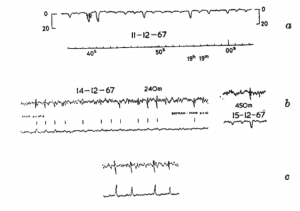 Figure 2: Data from the Interplanetary Scintillation Array (IPS) radio interferometer at Mullard Radio Astronomy Observatory in 1967. The periodic increase in flux is on the scale of seconds and show the very first measurements of a pulsar. The radio telescope (IPS) commissioned in 1967 at Mullard Radio Astronomy Observatory was one of the first arrays pioneering the use of aperture synthesis and was initially put into use for observing and understanding interplanetary scintillation. This effect was seen to be causing compact radio sources (e.g. active galactic nuclei) to have varying intensities on the order of seconds (analogous to stars twinkling due to the atmosphere). The understanding was that this scintillation was occurring from fluctuations in the density of plasma from the solar wind. It wasn’t until Bell began looking at many nights of data that she realized what she was observing couldn’t be related to ionospheric conditions, terrestrial interference, or anything of our solar system. These small increases in flux were periodic to a very high degree and would only occur at specific positions in the sky. They typically lasted for 0.3 seconds and had a period of 1.33 seconds. The data presented in the paper can be seen in Fig. 2, which shows the periodic weak spikes in flux that Bell initially noticed. What allowed them to determine that it was not within the solar system was that it had nearly no measurable parallax but they could calculate the frequency dispersion of a radio emission passing through a plasma. Using this measurement they could estimate the object to a distance AU. As pulsars had yet to be seen (and there was no reason to believe they existed) the source of these periodic radio emissions was perplexing and initial thoughts were that it was a neutron star or white dwarf. This is suggested after putting a constraint on the radius of the object of km based on the energy if it were to emit isotropically and the duration of the emission across different frequencies. Of course we’ve since learned that pulsars are a form of neutron star (or white dwarf). What makes them particularly interesting is that they are very highly magnetized which produces a beam of radio emissions at their magnetic poles. Coupled with their incredibly fast rotation, these radio emitting poles sweep around giving exactly the type of pulsing signal Bell saw in 1967. Based on the initial results of these early pulsar detections there was great concern that these were issues with their equipment or radio interference. However Jocelyn Bell defended the idea against her advisor, Antony Hewish, that these periodic emissions were a unique extrasolar source. Unfortunately even though Bell was the original astronomer to analyze and discover the pulsar detections in their data, she was ultimately overlooked in the award of the Nobel Prize. Since 1974 her exclusion from the award has been largely seen as a huge injustice due to her initial contributions. Thanks for this bite, Joshua. Professor Dame Jocelyn Bell gave a fascinating interview at the Edinburgh Science Festival in 2015. It’s over an hour long, including questions from the audience, but really worth watching. There’s a clip within the interview from a 1970s BBC TV documentary in which Jocelyn was interviewed… And – at age about 25 – referred to as “a girl”. Like so many women, Dame Jocelyn is one of my heroes. being made a ” Dame” is the equivalent of a man being made a Knight and is a seriously important mark of esteem.